TAKE LIFE TO THE NEXT LEVEL. 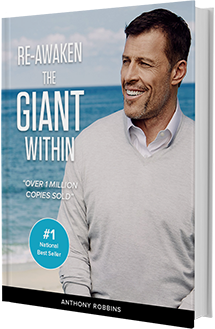 Over 20 years ago, Tony Robbins' landmark bestseller Awaken the Giant Within hit shelves, and a revolution began. It was a movement of transformation — of taking immediate massive action toward your goals: of mastering your health, emotions and finances and of creating and growing the ultimate relationship. More than 20 years ago, readers of Awaken the Giant Within woke up and decided to never settle for anything less than an extraordinary life. Today Awaken the Giant Within is a landmark bestseller that continues to create breakthroughs around the world. Fill out the form below to download your FREE copy of Re-Awaken the Giant Within. We respect your privacy. Your email address will not be shared or sold to a third party. "Today, 15 years later, I have achieved EVERYTHING I set out to achieve to end the depression in life. I went to college, then University, and am now married, with a 3 year old son. Also, I now successfully own TWO businesses that I started from scratch, and make more money now than I ever thought possible! Why? Because I learned to believe in MY OWN POWER of change - thanks to Awaken The Giant Within!" "If you truly do not want to change your life then do not read it, but if you do, you must buy it. Take your time learn from it." "I am a Masters Level Mental Health Therapist (with honors from University of Washington) This book and Personal Power II are still top level material for taking next steps in your life. Have given many many of these to my clients. Among the best written - through all time." To celebrate over two decades of radical transformation, we've compiled the best insights from Awaken the Giant Within—including how to crush your obstacles, how to use your personal values to achieve what you desire most, and how to use pain and pleasure to shape your destiny—into this special gift edition, Re-Awaken the Giant Within. Today we're giving you this book to download absolutely free. It's Tony's gift to you.